Today’s book review is for Hocus Pocus Takes the Train, story by Sylvie Desrosiers, illustrations by Remy Simard, published by Kids Can Press. I received an electronic copy of this book through NetGalley in exchange for an honest review. 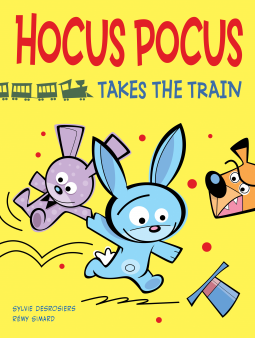 Hocus Pocus Takes the Train is a wordless comic adventure for children. It’s a book that both readers and pre-readers can enjoy. Despite the lack of text, there is still a strong, rich story to be enjoyed. Desrosiers has written a story about a magician’s rabbit who find’s a toddler’s stuffed rabbit toy. He wants to reunite toy and child–but he will have to face a tight train schedule, an intimidating dog, and more to achieve his goal. The story is fast-paced and action packed, while at the same time sweet and heart-warming. Children will enjoy Hocus Pocus’s clever problem soliving, resourcefulness, and persistence in completing his quest. Simard’s art tells the story wonderfully. In a wordless comic, the pictures must tell the full story in order for it to work. This story definitely works. His angular characters and spring-time palette are appealing to the eye and echo the style of popular cartoons. They inform the audience that this is a playful tale with a happy ending. One of the things that I like about wordless comics is how well they can be used in a classroom setting. They provide an excellent opportunity for writing exercises where students have to provide the text that should accompany the images. It also encourages children to learn how to read and decode visual media. We live in a world where visual literacy is often just as important as verbal. We are surrounded by infographics, advertisements, and IKEA instruction manuals that we are expected to make sense of. Comics, particularly wordless volumes, can help to develop the skills needed to do so. This book earns 5 out of 5 stars for great story, great illustration, and great design. I think that it’s a great example of why comics are becoming an increasingly well respected medium in children’s literature. 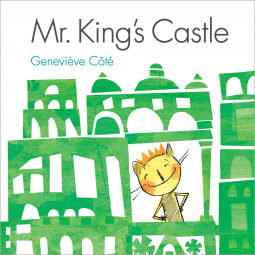 Today’s book review is for Mr. King’s Castle, by Genevieve Cote, published by Kids Can Press. I received an electronic copy of this book through NetGalley in exchange for an honest review. Mr. King is an adorable cat who lives on top of a beautiful hill. One day, he decides that he wants to build himself a big castle. So, he begins to cut apart the hill for blocks to build his castle. But soon, his friends and neighbors discover what he’s done and become very upset with him. When Mr. King realizes his mistake, everyone pitches in to help put things to right. Genevieve Cote writes a charming story to which children will surely relate. Her prose is simple and clear, perfect for a toddler audience. I love the message that sometimes our big ideas don’t always work out as well as we had imagined–but it’s alright to realize our mistakes and fix things. Children will make many mistakes in their lifetimes; it’s to be expected. The important thing is to learn how to fix those mistakes and put things to right. Cote also manages to touch on themes of greediness and common goods without ever seeming heavy handed in her moralizing. I appreciate that the friends and neighbors never yell at Mr. King or call him names, instead, he is able to recognize on his own that he is the cause of their frustration. Cote’s mixed media illustrations are great fun. The animal inhabitants of the hill are hand drawn and quite cute. Composed of simple lines and gentle shading, they still have a great feeling of life about them. It’s the landscape of the hill that I most enjoyed, though. Cote uses actual paper to create the hill–and then physically cuts it up to create the blocks for Mr. King’s house. It’s a clever technique, one that I think will help children to really understand that Mr. King is, quite literally, tearing apart the landscape to build his castle. It also adds an element of humor when the woodland animals are left standing on tiny scaps of paper, wondering what happened to their home. This would make a great selection for story time. The book is designed so that “big” is always in a larger, bold font, while “small” is shrunken down. It’s easy to read the text on the page, so that even a teacher or librarian trying to read upside down while showing the pictures to an audience should have an easy time following the story. There are plenty of opportunities to create character voices or sound effects to have extra fun with the book. Mr. King’s Castle earns 4 out of 5 stars. It’s a fun book that would make a great addition to any young child’s library. It’s beautifully executed and has a great message. 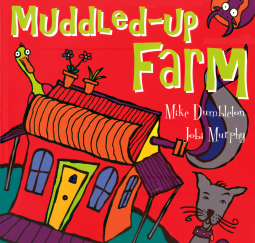 Today’s book review is for Muddled-Up Farm, written by Mike Dumbleton, illustrated by Jobi Murphy published by Star Bright Books. I received an electronic copy of this book through NetGalley in exchange for an honest review. Dumbleton’s writing has a strong rhythm. The rhymes are predictable, thus making many of the jokes predictable, but that doesn’t seem like much of an issue for the target audience. While I was reading the text, I could almost hear it set to music, like some old folk song. It’s got a lively beginning and a humorous climax, but the resolution was completely omitted. I kept trying to turn the final page, convinced that surely there had to be more text. But there was not. As mentioned earlier, Murphy’s illustrations are vibrantly colored. The farm animals are all rendered in a cartoon style that fits the mood of the book quite well. I particularly enjoyed some of their facial expressions. On the other hand, I felt that many of the pictures of the farm inspector were poorly executed. Although Murphy uses the same black outlines and flat patches of color in all of the illustrations, at times the farm inspector seems to have been rendered in a different style than the animals. One image in particular that didn’t work for me was when the farm inspector turns red-faced and angry. The book has a middling design. The first seven pages of the story were actually quite nicely designed. And then the seemingly random changes in design began. It made sense to change some of the page layouts once the farm inspector arrived on the scene, because the narrative style shifted at that point, too. Before that point, though, the changes gave a visual signal that something about the text was changing–even though that wasn’t the case. As a result, Muddled-Up Farm gets 2 out of 5 stars. For what it was, it was fun–but it definitely came across as incomplete. All other criticisms aside, it’s hard to like a book when it’s missing its ending. 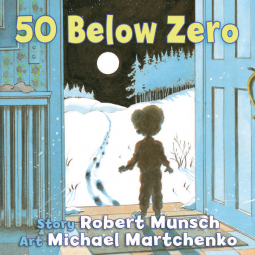 Today’s book review is for 50 Below Zero (board book edition), written by Robert N. Munsch, illustrated by Michael Martchenko, published by Annick Press Ltd. I received an electronic copy of this book through NetGalley in exchange for an honest review. This is a board book adapted from Munsch’s 1986 bestselling picture book by the same title. While I have never read the original book, I found that I enjoyed the board book a great deal. 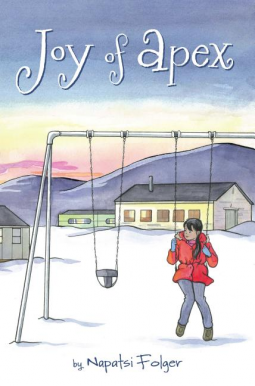 50 Below Zero is about a boy named Jason who has a sleepwalking father. Throughout the night, Jason hears noises, gets out of bed, and finds his father sleeping in the most unexpected places–including outside, against a tree, in the bitter cold. Eventually Jason grows tired of sending his father back to bed and comes up with an ingenious solution. Munsch’s sense of humor wonderful. He delights in the absurd and recognizes that it’s a type of humor that will appeal to toddlers as much as to adults. His writing is clear, simple without being bland. It’s easy to see why his original volume was so popular. Martchenko’s illustrations are equally entertaining. He does a fabulous job of capturing the emotions of his characters through facial expression and body language. The style of the illustrations feels slightly dated–although the details do not. Through heavy use of blues and grays, Martchenko creates a strong night time environment. The book is nicely designed. Bold, easy to read text is placed on white background with facing page illustrations. On the pages where Jason discovers his father there are wavy strings of blue “zzz”s and the exclamation “Papa, wake up!” is highlighted in red. One children are familiar with the story, this can easily serve as a cue for them to participate by joining in with Jason’s call. I gave this book 4 out of 5 stars because I really enjoyed it. It made me chuckle as I read. Even more than that, it’s a bit different from most of the fare I see in board books. A lot of board books are playful, but far fewer are actually clever. It’s nice to see a bit of variety for our youngest readers. 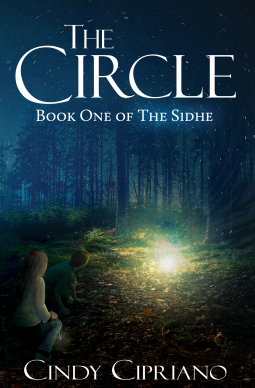 Today’s book review is for The Circle: Book One of The Sidhe, by Cindy Cipriano, published by Odyssey Books. I received an electronic copy of this book through NetGalley in exchange for an honest review. The Circle is the first installment of a new fantasy series targeted to the tween audience. Calum Ransom is an upcoming sixth grader with a secret–like his mother, he’s a Sidhe. He’s haunted by the disappearance of his cousin Finley, but is soon enough distracted when new girl Laurel Werner arrives in town. Laurel has a secret of her own that involves a necklace with a dark clan’s mark. Once they reveal their secret to the other, they discover that by working together, they might just be able to solve both of their problems. Cipriano’s debut novel is captivating. It took me a few pages to settle into it, but once I did–I was hooked! She uses traditional fairy lore to start building her universe, but then adapts it to make it uniquely her own. By the end of Chapter One, she’s already set up plenty of questions for her audience. And while many questions are answered by the end of the book, not all are. In this way, lays the groundwork for future novels in the series. If we want to have our questions answered, we’ll just have to keep reading. It is clear that this is a first novel for the author, though. There are moments where the dialogue feels unnatural, for example when Calum’s mother, Kenzie, greets him with “Good morning, son.” The words seem ridiculously formal, especially in comparison to Kenzie’s usually relaxed speech style. I also disliked some of the incredibly specific pop cultural references; when they referred to something unfamiliar to me, I felt alienated from the story and I imagine younger readers will feel the same. I suspect that it will make the story feel prematurely dated ten years from now. That said, Cipriano has enough skill at creating engaging characters and capturing adolescent emotion that overcoming these shortfalls should not be a problem. There are some minor typographical errors in the text, that should be easy to fix in a second edition. Likewise with some of the formatting that leaves excessive amounts of white space at the bottom of some pages. The cover design features an attractive image, but then uses font selections that make the whole thing look a bit amateur. These are all common problems that I see with many of the newer small publishing houses. It’s a shame in this case, because I think it detracts from a work that has the potential to compete in major markets. Despite the problems mentioned I’m still giving this book 4 out of 5 stars. Cipriano is a skilled writer and talented storyteller. With a touch more editorial guidance, she could easily produce a 5 star story. I look forward to reading the next installment in this series. 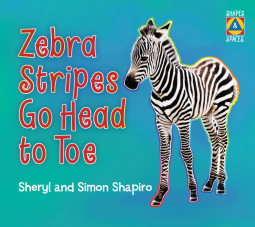 Today’s book review is for Zebra Stripes Go Head to Toe, by Sheryl and Simon Shapiro, published by Annick Press Ltd. I received an electronic copy of this book through NetGalley in exchange for an honest review. Zebra Stripes Go Head to Toe is a companion book to Ladybugs Have Lots of Spots, which I reviewed last week. This book uses the same sort of rhyming text and colorful stock images to convey its ideas. I’m sure that the colorful stock images will appeal to children. They a brightly colored and crisp. Many feature young children engaged in play. The book design, however, doesn’t seem as professional as its sister volume. There’s not much variety in the page layouts and the amateur blurring effect is used more liberally. And once again, we’ve got playful, but generic, text. Worst of all, the concept for this book was a bit muddled to me. For most of the book, it seems that we are exploring squares. I was puzzled, because the title suggested that we would be exploring stripes–but then, just before the end, we got to the stripes. At this point, I wasn’t entirely clear about why squares and stripes were thematically similar. I mean, squares are composed of lines, just as stripes are… but so are triangles, hexagons, rectangles, diamonds, octagons and more. Unfortunately, Zebra Stripes Go Head to Toe earns 1 out of 5 stars. Above all, a concept book should illustrate a clearly identifiable concept. All other aspects aside, this book fails to meet even that most basic criteria. I’m sure the authors had an idea of what they were trying to accomplish, but it didn’t come through in their work. 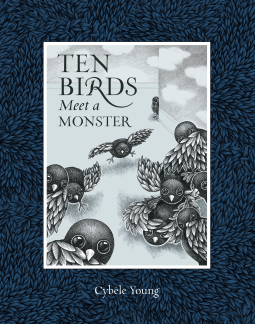 Today’s book review is for Ten Birds Meet a Monster, by Cybele Young, published by Kids Can Press. I received an electronic copy of this book through NetGalley in exchange for an honest review. Author and illustrator Cybele Young delivers a visually engaging and playful counting book in Ten Birds Meet a Monster. The ten titular birds are playing with a pile of clothing and shoes, when they see a fearsome monster’s shadow looming in the closet. The first bird puts on a garment in an attempt to disguise himself as a scarier monster, but to no avail. Over the course of the book, one by one, the other birds join in, creating new and ever more elaborate monsters. But it’s the easily distracted tenth bird who finally conquers the monster and saves the day. Young’s language is playful and inventive. She demonstrates her skill at selecting words throughout the text, particularly in the adjectives she uses to describe each bird. At the same time, she shows us that she can just as well create her own word when none already exists to do the job–her clever monster names employing amusing portmanteaus. This is a book that is fun to read aloud. There is a natural rhythm in the text that flows off the tongue. The story is engaging enough to appeal to a wide audience from pre-school to early elementary. It’s Young’s pen and ink illustrations that bring the text to life, though. Each page features gorgeously rendered pictures, full of exquisite detail: from the plumage on the birds to the varying textile patterns. I loved the way that she was able to convey the birds’ alarm through expression and body language, while still using a fairly realistic art style. The whole thing comes together in a beautiful book design. Even before I became a parent, there were times that I wanted to purchase picture books simply because they exhibited exceptional design. I’ve always been partial to a beautiful book. From front to back, Ten Birds Meet a Monster has been carefully designed. This attention to detail is what can separate a book that you’d like to read from a book that you’d like to own. And this is definitely a book I would be happy to own. This title has earned 5 out of 5 stars. Counting books can get tedious–so if I have to read one, it should at least be beautiful and original. Young delivered. Engaging text, exceptional illustrations and excellent design… it’s got all the elements of a great picture book. 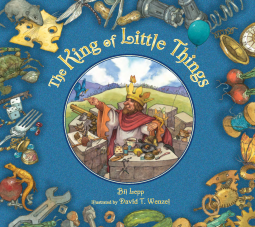 Today’s book review is for The King of Little Things, written by Bill Lepp, illustrated by David T. Wenzel, published by Peachtree Publishers. I received an electronic copy of this book through NetGalley in exchange for an honest review. The King of Little Things is a new fairy tale about two kings. The first King, the King of Little Things, lived in a small kingdom where he was sovereign of all things tiny. He led a happy and fulfilling life with a loving queen and was content with what he had. The second King was named King Normous. And King Normous was never satisfied–he always wanted more and most of all he wanted to be king of the entire world. But when he discovers the King of Little Things, King Normous finds out that little things can cause big problems. This fun tale will help children to see that bigger isn’t always better sometimes the littlest thing makes all the difference. Lepp is a gifted storyteller. Not only has he come up with a great idea for a story, but he manages to relate it with skillful language. At the outset, he uses rhythm and alliteration to pull young children into the story by listing some of the many things that are in the dominion of the King of Little Things. He uses narrative tools such as rephrasing or restating with greater detail to emphasize ideas within the story, techniques common to the fairy tale genre. And throughout there are bits of humor masterfully woven into the tale that are sure to make both adults and children chuckle. Wenzel’s illustrations are great. He uses a soft style and muted palette that suits the genre well. What makes them stand out is the attention to detail. In one image, King Normous sits after his conquests with an excessive ten crowns and headdresses stacked atop his head. Another depicts a map where every territory, save the Kingdom of Little Things, is marked with “MINE.” Wenzel artfully highlight’s Lepp’s humor–and adds to it–in his pictures. As a result, both the text and illustrations feel like integral parts of the story. The book design is competent and professional. The typeface is clean and readable. Text is placed in the negative space of illustrations so as not to compete with the artwork itself. Page layouts vary facing page illustrations and two page spreads which enhance the pacing of the story. This was a fun book to read and I look forward to sharing it with my daughter. It earns 4 out of 5 stars for being entertaining, creative, well-conceived and well-executed. If you’ve grown tired of the same old familiar fairy tales, definitely give this one a try. It’s got an excellent balance of moral and humor to keep adult and child entertained. 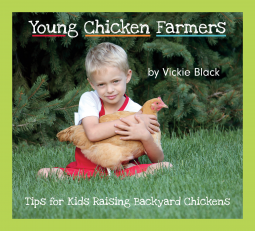 Today’s book review is for Young Chicken Farmers: Tips for Kids Raising Backyard Chickens, by Vickie Black, published by Beavers Pond Press. I received an electronic copy of this book through NetGalley in exchange for an honest review. To begin with, I should disclose that I love chickens. I’m not entirely sure when or how this love originated–but it’s there and it’s strong. If I had the space and resources, I would love to be a backyard chicken farmer myself. In the event that day eventually comes, I definitely want to have a copy of this book on hand. Although it’s targeted to children, I found Young Chicken Farmers to be incredibly informative. Black has a wonderful writing style that manages to pack a lot of terminology, facts, and information into this short volume–but without being dry or boring. Instead she includes bullet lists, numbered lists, labeled pictures, and asides to make a truly engaging book. The book itself is colorful and fun. All of the photos were taken by Black, and many are images of her own children practicing the skills described on the page. I love how vibrant the pictures are–strong colors, crisp detail, great lighting. All of these elements are brought together an a masterfully executed design. Some photos are arranged on the page in a small collage, with multiple typefaces used to differentiate the asides and lists from the primary text. Backgrounds are strongly colored and visually appealing. Small details like arrows, outlines, and geometric accents make the book pop. If you know a child (or adult, for that matter!) who is interested in chickens, this book would make a great gift. It’s certainly a book that I’d like for my own daughter’s shelf. Unsurprisingly, I give this book 5 out of 5 stars. It’s awesome. There’s plenty of information here to satisfy even the merely curious. The author even makes a point of explaining to children how to ensure their chickens are mentally healthy as well as physically healthy. Now, will someone go buy me this book, please? You can find more information about this title, including other reviews, at Goodreads.